December 29, 2016 — His wasn’t my first giant’s grave, but Robert Pershing Wadlow’s final resting place was somewhat different for me. He’s kind of haunted me over the years. Looked over my shoulder, you could say. I discovered him at the Ripley’s Believe It or Not! Museum at Niagara Falls in the early 90s. it was a high school trip. At some point, for no real reason, we found ourselves in that museum. 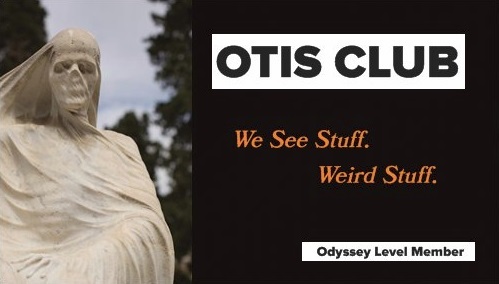 This was long before I had an interest in oddity. In fact, my only interests then were gangsta rap and ice hockey (I wore a lot of L.A. Kings hats). “Believe it or not” was just a line Jack Palance hissed at me on random Saturday afternoons. 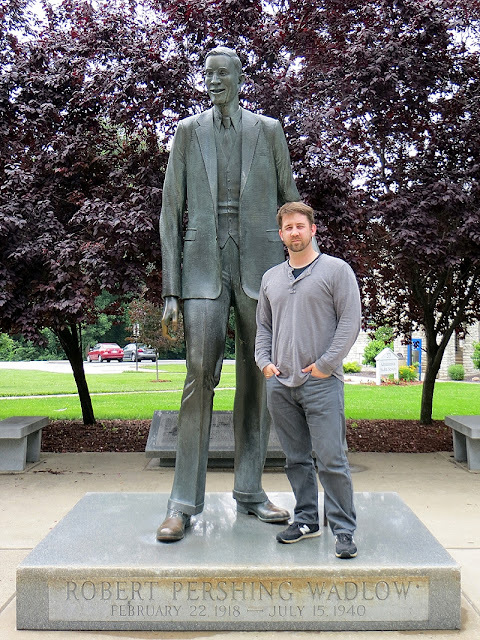 And I only really remember one thing about the visit: A life-sized, full-color statue of Robert Wadlow. Let me phrase that more succinctly. In a museum dedicated to oddity of every sort all over the world, it was Robert Wadlow who stuck with me. It wasn’t just his record-setting height, although that was a…big…part of it. At his tallest, he was over 8’11”—a record that still stands…tall…today, 75 years later. It was something about that combined with his incongruous looks. His rounded spectacles. That hair parted conservatively to the side. His youthful face. That suit and tie. Overall, he had a gee-whiz quality to him that that belied his phenomenal frame. This was no ferocious-looking, bigger-than-life Andre the Giant. This guy seemed almost, I don’t know, cheerily bemused by it all. And I’ve thought a lot about him over the years. Because I keep running into statues of him. At the same Ripley’s a decade and a half later. Another Ripley’s in New York. Marvin’s Marvelous Mechanical Museum in Michigan. 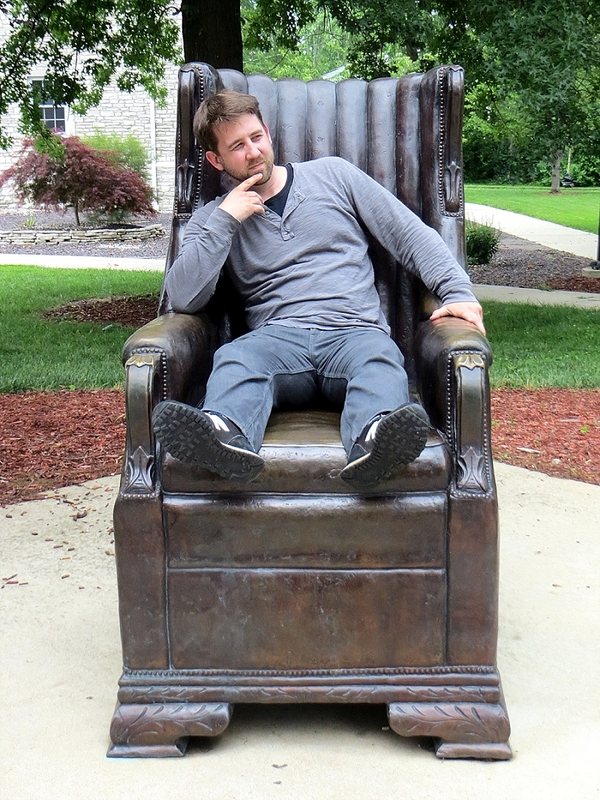 And then in his hometown of Alton, Illinois (home of the Piasa Bird). Wadlow was born in 1918. It didn’t become apparent until later that he had pituitary hyperplasia. Gigantism. The pea-sized gland in his brain wouldn’t stop producing hormones. Toward the end of his life, his almost nine-foot-tall frame weighed 439 pounds. Every second of his life was world war with gravity. His legs were perpetually numb and he wore legs braces for support. Walked with a cane. Many of those afflicted with his condition die when their heart gives out, unable to do the work needed to get blood throughout their enormous frames. But it wasn’t Wadlow’s heart that did him in. It was the braces. An improperly fitted pair caused a blister on his leg that he didn’t detect until it became infected due to the numbness in his legs. That, combined with an autoimmune disorder, felled the giant. 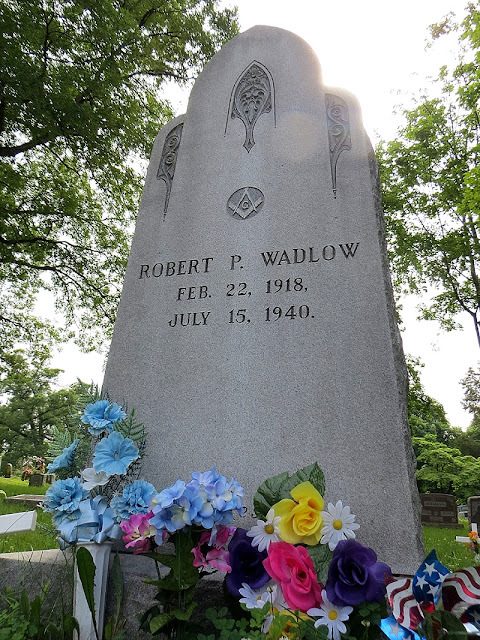 He’s buried in his hometown in Oakwood Cemetery at 2090 Oakwood Avenue. The grave is relatively easy to find. His stone towers over its neighboring stones as he towered over people in life. Just about everything in his life had to be custom-made—his clothes, his furniture. Even his coffin: 10’9’’ inches long, 30” deep, 32” wide. It weighed half a ton and then was sheathed in concrete so that neither vandals nor medical researchers could get to him. No epitaph, nothing about his extraordinary life. Just his name, a Masonic symbol (he was a Freemason), and his dates, the latter indicating he lived a mere 22 years. But he packed a lot in that short time. Traveled hundreds of thousands of miles around the country with both the Ringling Circus and then to promote the shoe company that made his massive 37AA-sized footwear. He would leave shoes behind at various stops as promotional items, so they’re common at museums and other places that value oddity. Alton’s town museum has a pair, along with other artifacts and photos from his life. And, like I mentioned, there are statues of him everywhere. But his most dignified statue is 1.4 miles from the cemetery, where it has stood across from the Alton Museum of History and Art since 1986. 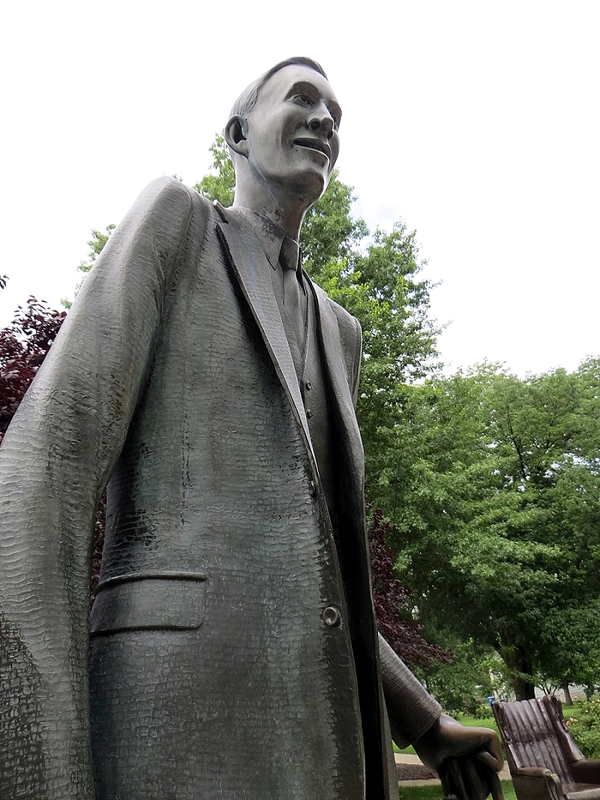 Most of the statues of Wadlow look rather gooney, but this one does him service. Part of that is because it’s a bronze statue, but it’s also how the artist carved his face, which is happy and more in proportion than it really was. You don’t gawk at this statue so much as appreciate the man whom it depicts. You can get right up to it and feel how strange it is to be dwarfed by another human being. I can’t imagine what it would be like to interact with him. I missed six foot by a cowlick and usually overtake it with my boots, so short or tall, I rarely notice people’s height. I came up to his elbow. There was also a bronze sculpture of a chair that had been custom-made for him, almost as if the town felt more proof was needed that a man that tall once existed. Of course you're encouraged to sit in it. According to its plaque, the original is at a Masonic lodge elsewhere in town. Most of the materials about him love the stats. His height, his weight. And those are great. But I want to know more about his perspective. I wished he’d have lived long enough to write a biography. Or a book of philosophy. Like, does being that tall and being the only human who’s ever been that tall change what you think about people? In the middle of a crowd, he was still in a separate place, feet above everything, with a literal and perhaps figurative perspective that no one has ever lived through. And I know other giants have cleared eight feet before. But only a dozen or so. And he’s even a head taller than most of them (the closest to him was John Rogan, who was 8’9”—he lived 40 years and died more than a decade before Wadlow was born). Had Wadlow lived longer, he would have cleared nine, maybe gotten close to ten, as his growth showed no signs of stopping. It boggles me all up. I don’t know. Maybe he was just cheerily bemused by it all.